Derived from the classic text originated by Lubert Stryer and continued by John Tymoczko and Jeremy Berg, Biochemistry: A Short Course focuses on the major topics taught in a one-semester biochemistry course. 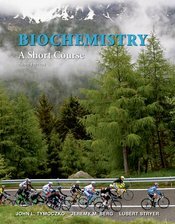 With its short chapters and relevant examples, it’s uniquely effective in helping students see the connections between the biochemistry they’re studying and their own lives. This new edition takes into account recent discoveries and advances that have changed how we think about the fundamental concepts in biochemistry and human health. A number of new interactive features are designed to help instructors create a more active environment in the classroom. Those new resources are found in LaunchPad, the third edition’s dedicated version of W.H. Freeman’s breakthrough online course space.